I was finally able to put these fractured pinwheel blocks into a quilt top. 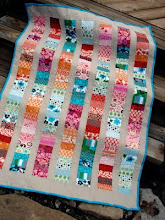 I abandoned my obsession with pink and used a blue pindot as setting blocks and a green dotted fabric as the border. 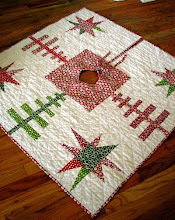 I think with quilting it will look fine. Hope to get the back done tonight. Since so many of you asked I'll be putting together a quick tutorial on the fractured pinwheels too. I'm trying so hard not to start new projects. 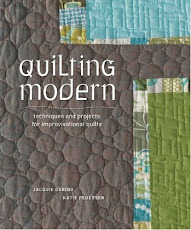 I am working my way down the WIP list to see if I can get everything to the quilting stage. 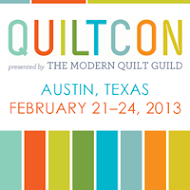 (I'm psyching up for a marathon quilting when I can get access to my mom's machine again.) I made 16 blocks for the Fashionista quilt. Pictures of that soon. Maybe it will be a top tonight! Lastly, it's my birthday today. Ran 1.66 miles this morning in 20 minutes. Two days running so far this week. Only did 2 days total last week, arrrg! That's in the past so I'm moving on. I'm off to clean the house. My birthday present to myself. Hope you are having a happy day too! Happy happy birthday!!! Hope it is a great one :cD Good for you geting that run in. Like you said, that 2 running days in one week thing is in the past, keep looking forward. You're doing awesome! Hope you have a totally awesome b-day filled with everything you love! Happy Birthday! Mine was a week ago today. I'm not running though but I did finally get back on my recumbent bike. Have a great day! 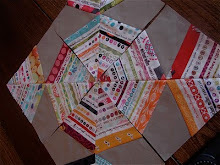 I love the fractured pinwheel blocks. Happy Birthday...do something fun and laugh all the day...the laughter will add 8 years to your life (or something like that). For one fun thing - go fabric shopping. Happy birthday! And congratulations on the run. I can't wait to see all of your projects get finished. They are going to be gorgeous. Happy birthday Jacquie.....hope you do whatever you enjoy and that you are spoiled rotten! Well, happy fit and fun birthday to you! Hope there's wine in there somewhere today as well! 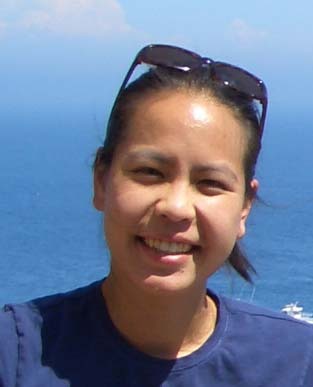 Jacquie - HAPPY BIRTHDAY! Good for you. Have a sweet and happy day. Happy Birthday!! As far as the cleaning house thing, it's your birthday so you should do what you want. Hey, it wouldn't be my first choice... LOL!! Happy Birthday!!! Don't clean too hard! Make sure that you have a fun day in there too!! Happy Birthday to you! We nearly share the same day. Mine was yesterday and cleaning the house was last on my list. Enjoy! I like the blue dots with the pink pinwheels. Happy happy day, Jacquie!!! I know you will make the most of every single minute of your day! Congrats on the running!!! Cheers to a better you!!! Happiest of birthdays to you! I hope your day is filled with joy and love. It's not my birthday and I definitely don't want to clean house, but I may have to. I can't find my cutting mat. Have you ever known anyone to misplace one? Of course, I am the girl who once lost her vacuum cleaner. Do you have a pink obsession, too? Half of my stash is pink, and my husband is always wondering what I am going to do with all that. I am hoping Asha will always love pink. You totally inspired me, and I have been working out 5x a week for three weeks now. It is amazing how much I can fit in a day when I make that a priority. I feel better. Happy happy birthday!! Hope that you have a great day!! I hope you have a fabulous birthday! Happy Birthday, Jacquie ... from one Tar Heel to another! Today is my twin girls' birthday, too. I'm so glad we've connected this past year -- your work is so motivational and inspiring. I hope there's a lot more to come in the year ahead! Many Many Happy Returns of the day Jacquie. And thanks for visiting my blog, you made my day. Happy birthday! Ours are only a few days apart. Love the quilt and totally understand about the WIP pile! Happy Birthday Jacquie!! Enjoy your day!! I hope to get back into the exercise groove tomorrow! Happy birthday! We (almost) share the same birthday. (I'm the 6th). Sending lots of birthday wishes your day! Hope your day is a lovely one. 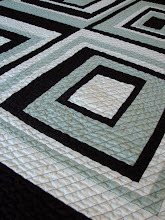 I love the blue pindot you used on your quilt - finishes it off perfectly! Happy Birthday. And great fractured blocks, too. Well, Happy Birthday! And the quilt looks fabulous (as usual). I'm trying to finish what I have started before I move on, but I'm just not inspired to finish it, so I'm not doing much. Good for you for being good. 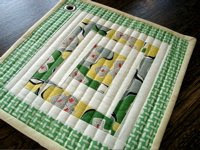 Love the little quilt, I am always amazed by your work. You always do something a little unexpected but turns out tottaly awesome! 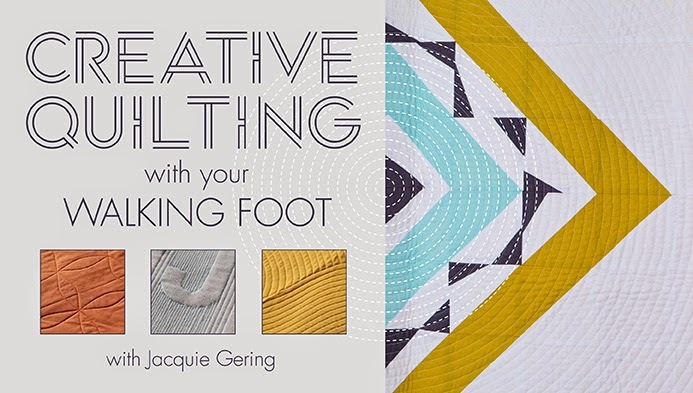 You are definately an inspiration to me (running and quilting). Happy Birthday! 21 again, huh? It's finally cool enough around my place to think of quilting again, so I know what you mean about a stack of tops lined up, waiting. This one of yours is really cute. Hey Jacquie, happy birthday! Hope you have a great day! Happy Happy B-Day...Hey 2 days is better than nothing. Good for you. Can't wait for that tutorial. I'm also working hard on my first quilt, hopefully I will be done, and finish also a wallhanging I'm doing. happy birthday, my friend! I hope you have had a good day. Happy Birthday! Hope you had a great day! Love the Blue Polka dots! Happy Belated birthday!!!! I hope your day definitely consisted of more than cleaning house. I hope you had some me time. By the way, keep on running! Exercise it does a body sooooo good! Love the blue with the pink! Happy birthday - and good for you in keeping up on your running! Happy Birthday! 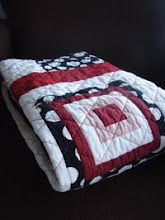 Love your quilts.. looks like you are an addict as well. My feet won't be running but my sewing machine will! I'm a day late but Happy Birthday anyway. I had to laugh when you said you were going to clean your house. that is what I always want to do too. I guess it is starting the new year off right or something. Happy Belated Birthday! Keep up with the running. (I should be taking my own advice here, LOL.) Soon you'll be running a few miles a week and won't even notice. Happy Birthday! a day late, but special wishes no the less. Good for you Jacquie! Happy happy day! Happy belated birthday, Jacquie!! I hope it was spectacular!! (and of course, I love the fractured pinwheels! The use of blue is perfect)!! Happy B-day to a fellow Virgo. Hope you had a great day. Happy Birthday Jacquie!! I hope you had a great day! Oh, how exciting about your son's show!! I hope you do a post on it and let us know if he has a CD. My boy's band made a CD at our community college when they were 14 (2 years ago) --though it's quite rough, it was a blast and such a great learning experience for them. Great job with your running also!! I forgot to comment yesterday, BUT I had been puzzling over your fractured pinwheels before and was going to suggest green polka-dot-ish fabric to tie it together--and you read my mind! It's looking lovely. Happy Birthday! Having a clean house always makes me happy, too. Hope you enjoyed your special day and that the rest of your week has been great. well, happy birthday! love the way this one turned out!! looks great. I really like that green border. All my "new idea" quilts end up on my ever growing WIP (or UFO in my mind) list.....will get done sometime...when I'm 109.